Immediate, professional dispatch to your site! There are many reasons to make the decision to have a tree removed; among them are danger trees (trees which can cause an imminent and immediate hazard to property or personal safety), unhealthy trees (trees which may have decayed or damaged beyond their ability to sustain their own weight), trees which have grown beyond a manageable condition and no longer can be properly maintained, or simply trees which detract from the continued beauty of your grounds. 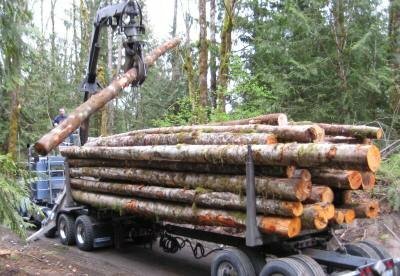 In many cases tight quarter trees (trees which by nature of their growth location are extremely difficult to either access or properly maintain) may need to be removed for safety to surrounding structures. Our equipment has been configured specifically to assist with these terrain and structure limitations. 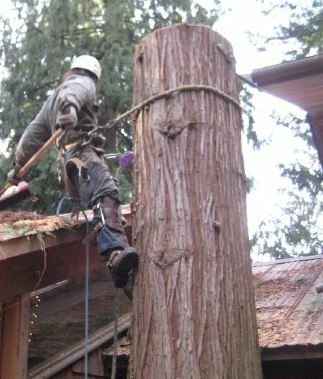 A call to Acme Tree Works can provide you with a professional and courteous review of your trees, their condition, professional recommendations and exceptional execution. branch removal and on site chipping. Our efficient, high volume reduction equipment converts piles of tree and brush debris into small, easily transported chips and mulch. Chips can be used on site or removed for environmentally sustainable disposal. Our chips have been used for such applications as buffalo and cattle stable bedding, walkways and commercial compost. A muddy trail can be converted to a luxurious, mulch covered pathway for year-round enjoyment by the addition of chips made from your branches and limbs. Now that the once beautiful tree is gone, all that remains is an unsightly stump. Many lots are littered with the remains of cut trees; only the sad and pitiful stumps remaining. These can harbor insect and rodent pests and interfere with your lot improvement plans. Our cost effective mechanical stump grinding is quick, efficient and can remove those cumbersome stumps from sight forever. 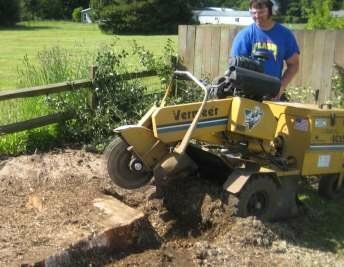 Our equipment is capable of grinding the stump up to 13” below grade and is configured for tight quarter access. Don’t dig it out yourself; call Acme Tree Works for a rapid, competitive quotation and prompt service. Clean topsoil cavity backfill is available upon request. 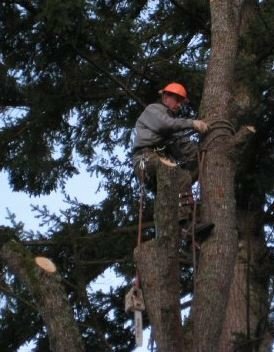 The practice of tree limbing (the selected removal of unwanted or damaged tree limbs) can assist in your total tree care program by elevating bottom branches to provide ground level space improvements, improve the esthetics of your grounds by the removal of unsightly branches, poor growth, dead or decaying limbs and reduce wind sail (the effect of wind against trees with densely packed limbs offering greater air resistance, which can result in catastrophic failure and significant potential for property damage and personal injury) by thinning selected limbs. Acme Tree Work’s technicians can provide professional consultation and exceptional tree limb maintenance. Animal Rescue: Did your cat climb your tree and needs to be rescued? Don’t call 911 for Emergency Services, call Acme Tree Works. Many relieved pets and their owners have Acme to thank for their prompt and professional attention to a stranded family member. Crane Service Available: Call now for an estimate.